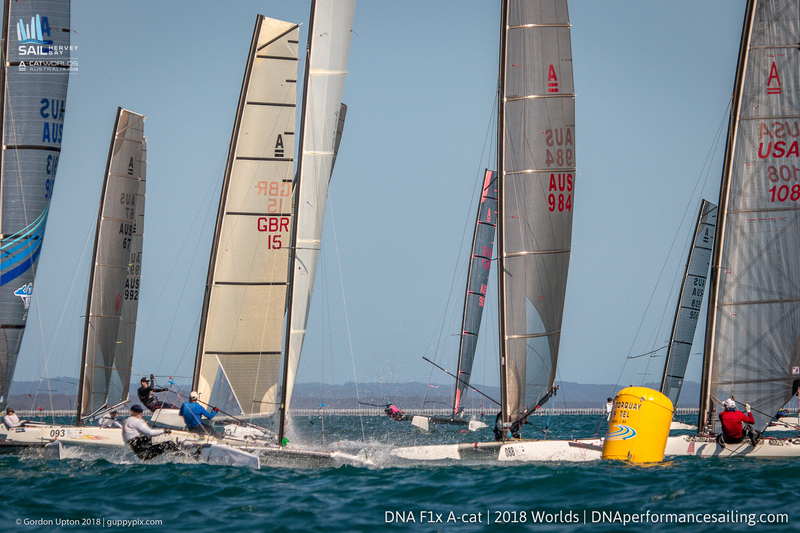 Both Classic and Open courses flew the postponement flags for a good 60 mins, and half of the fleet elected to remain on the sandy beaches of Hervey Bay. The others sailed out to the racing areas to test the conditions and finalise their low wind settings. A few of the foilers managed to find little gusts and jumped up on their wings for a couple of hundred meters before landing back down like ducks. Eventually, the wind direction stabilized and the flag dropped, flushing all the sunbathing cats from the beach. In an 8 kt wind, the Open foilers seemed to have a little trouble coming to heel. One start was cancelled 30 sec before the signal and most of the fleet seemed to be over the line. Then they had 2 General Recalls as the light wind didn’t stop boats drifting over the line in the tide flow. So, with recourse to stronger action, the PRO hoisted the Black Flag. This did the trick, and they were all off into the teeth of this 8 kt wind. A few of the sailors tried to get upwind foiling, but they all quickly realized it was a forlorn hope in those winds. 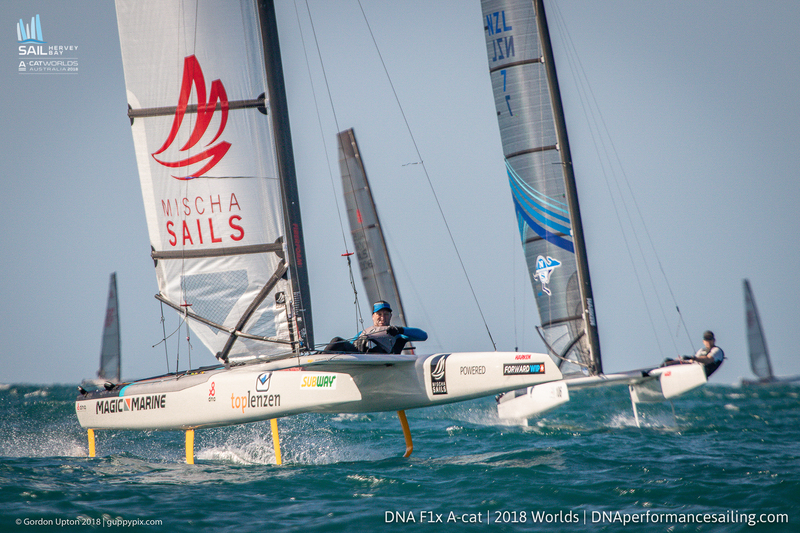 At the top mark, and much to his huge surprise and pride, the Holland Composites DNA designer ,Pieterjan Dwarshuis, (PJ to everyone who can’t pronounce Dutch names), beat this World class field by a good 20 boat lengths and reached the wind hole that was the top mark. Others floated around, including Glenn Ashby, who rounded 3rd. At the spreader nearly all gybed around and got into their low drag mode of mainly wishing they still sailed a Classic ‘A’ Cat. But Glenn sailed off in the direction of Bunderberg, presumably to get some rum. He sailed way out in search of more pressure, which he hoped to find nearer the shore. 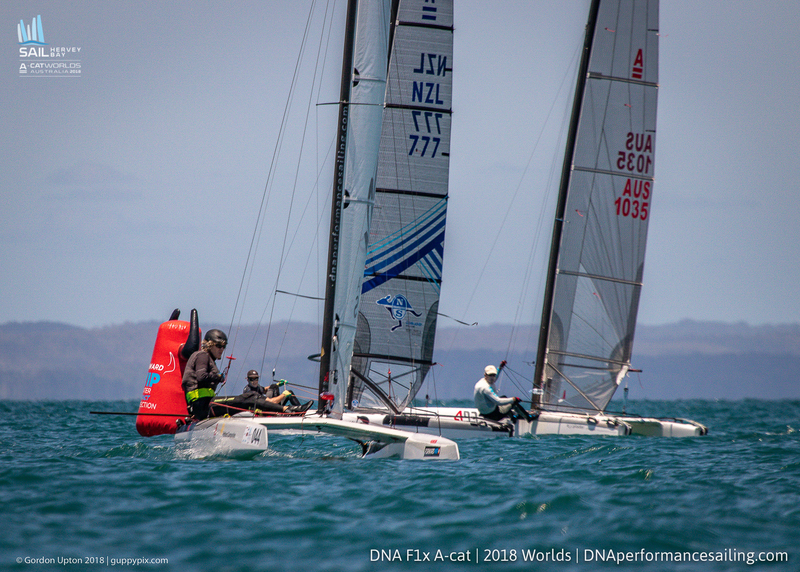 At the bottom mark, it was AUS Mark Bulka who rounded first, and led the drifting fleet back upwind to the repositioned and shortened top mark. Glenn somehow managed to get back, rumless, and was about 10thor so. Over the next two laps the field shifted about even more with the lead changing on each leg as the sailors hunted about for more pressure. 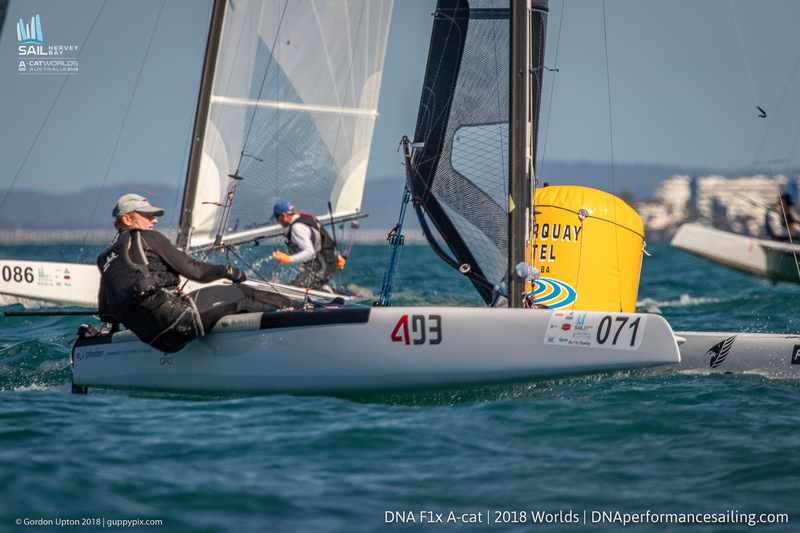 At the finish, it was Darren Bundock who won the tactical waterborne chess game, closely followed by Bulka and GER Bob Baier, then SUI Nils Palmieri with Glenn in 5th. 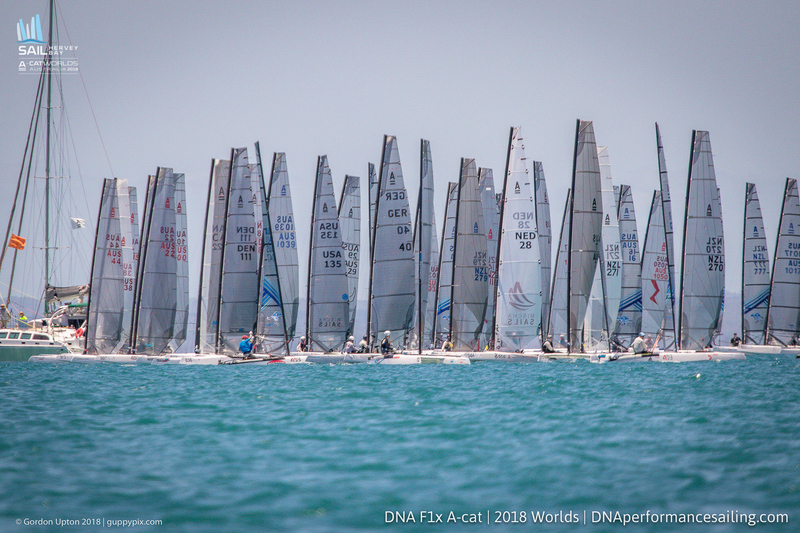 Back on the open course, the second race started cleanly in a much better 12 kt breeze. 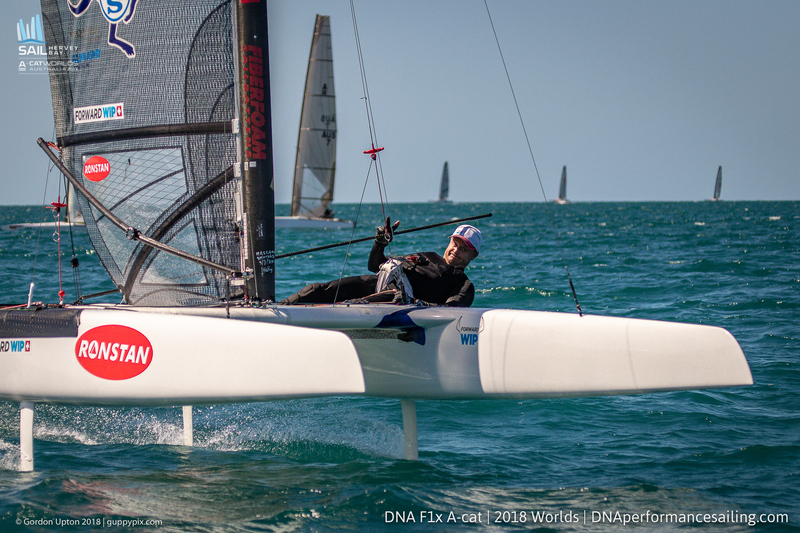 First at the top this time was FRA Emmanuel Dode on his DNA F1x, but then the race went more to the Ashby playbook, with NED Mischa Heemskerk for too far behind in 2nd. Ashby’s ETNZ team-mate was 3rd with Bundy in 4th. The final race was, again, a clean getaway for the PRO. This time the wind was a good 12-15 kts, bang in the zone for the foilers. 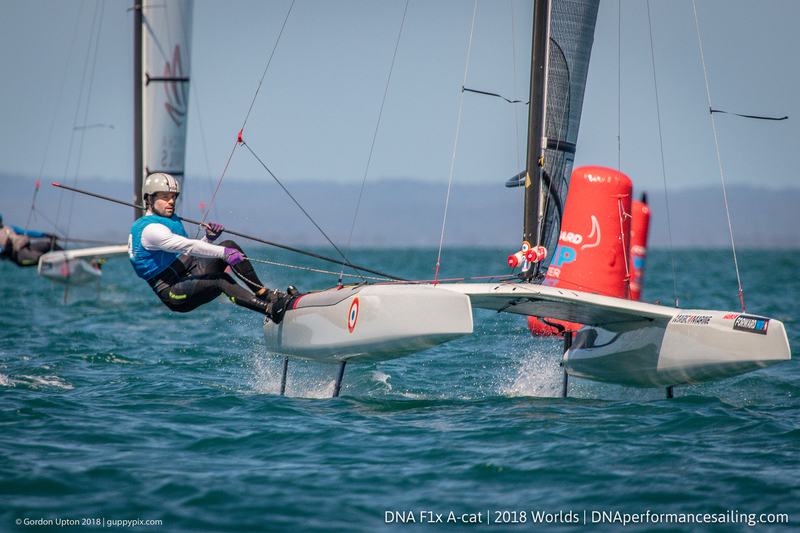 Plenty of action around the course as the sailors fought their individual duels with their peers. At the first mark USA Bruce Mahoney was on the money, having a good race with Bulka at the front. Ashby was ever present looking to pounce, but it was Mischa who put in the performance of the day. Today is possibly, and tomorrow definitely look to be blown off as the Northerlies are in control. It will all go down to the wire in Friday’s last three races. And they just can’t wait.